Banner headlines covered the nation when a large passenger plane was missing on a flight from Pittsburgh to Buffalo. Bradford Era image. Passenger airplane crashes were so numerous in 1951 that heroic rescue stories crossed into American pop culture with comics and Hollywood movies. Heroic Comics-Famous Funnies cover image. Late at night on December 29, 1951, after the deadliest year for passenger airplane crashes in the United States, a large war-surplus C-46 aircraft loaded with passengers, disappears while flying from Pittsburgh to Buffalo. By morning, America's promising dawn of passenger aviation plummets into a tailspin of panic and fear. It lands at the White House. Despite searchers fanning out over several states, the Great Lakes, and Canada, the plane can't be found. Banner headlines cry, "Airliner Missing with 40 On Board." The converted cargo plane, guided by newly certified pilots distracted by marital discord, was hours late and flying off regulations into some of the worst winter weather of the year. Crashing into a small mountain, it kills 26 passengers and crew members. Fourteen others are the largest group of plane crash survivors stranded for an extended period without rescue in North America. They steal clothing from the dead, and someone commits a more heinous crime on a dead passenger. When rescuers fail to arrive after two nights, the injured survivors send the fittest man stumbling down the mountain in knee-deep snow to find help. Pearl, George, and Lt. Bischof are the heroes of the plane crash. Ruby is the simple farmer's wife who gives them help while hiding a deadly secret of her own. A rigid and decisive stewardess, a brave passenger, a commanding lieutenant, and a sympathetic farm wife, they perform heroically to save the other plane crash survivors. Farmers and teenage boys race into the woods for rescue while thousands of plane crash tourists flock to the scene in gabardine suits, cotton dresses, and open-toed shoes. When the nation's top plane crash investigator makes his first-ever crash scene visit, he is ordered by the President to reign in the nearly free-flying first budget airlines of America. But, it's too late. More planes crash into densely populated areas of New Jersey leading to the four-month-long closing of Newark Airport. The tragedies grab the attention of Washington policymakers at a time when passenger aviation is just surpassing train travel. Hang on and Fly is a nonfiction story written like a novel, and it's packed with drama and emotion, bravery and heroism, and political intrigue during the rapid and uncontrolled growth of America's first budget airlines. It traces the origin of our belief that we're always safest in the back of the plane; the start of Hollywood's wildly popular airplane crash movie genre; and the beginning of modern airplane crash investigations. The tragedy was, perhaps, the most dramatic plane crash in the most significant year for advancing passenger aviation safety. Author Tim Lake tells the story as only he can. His family was there, and it gained him unique access to the families of victims and survivors of America's most devastating era of passenger plane crash history. Association Island's flying courier in a Curtiss JN-4, Jenny, about 1923. Austin-Giangobbe Photo Collection. Fishing, sailing, card-playing, shooting, golf, illicit-booze, eating, and drinking were all part of General Electric's first corporate marketing, training, and innovation retreat on a 64-acre island in Lake Ontario. Organized as a fishing camp for top American lamp executives in 1903, summer camp at Association Island eventually became a coveted invitation for thousands of GE employees and their families through 50 years of the company's most prosperous operations. GE leaders used the island as an informal setting for planning key decisions about the company's future. Association Island was equipped with a large boathouse, a fleet of motor and sail boats, dining hall, town hall/church/theater, cafe/bar, golf course, shooting range, and hundreds of unique sleeping cabins for the rustic camp gatherings on the island. GE employees traveled to the island from factories between St. Louis and Boston, and Philadelphia and Toronto. Executives traveled to the island from GE headquarters in Schenectady, by seaplane. Association Island portrays the GE boats, airplanes, island architecture, fishing trips, celebrity visitors, entertainment, and stories of how campers smuggled booze to the island from Canada during Prohibition. It's part of a bygone era of American corporate history and summer island life. Henderson Harbor in 2008. Association Island is at top left. Pilot-Photographer Dwight Church took some of the aerial images seen in Henderson Harbor. St. Lawrence University Special Collections. Hidden among the fertile farmlands and rocky shoreline of eastern Lake Ontario is a natural deep-water port and fishing village that has long been the quiet refuge of world-famous politicians and industrialists. And it hasn't changed. 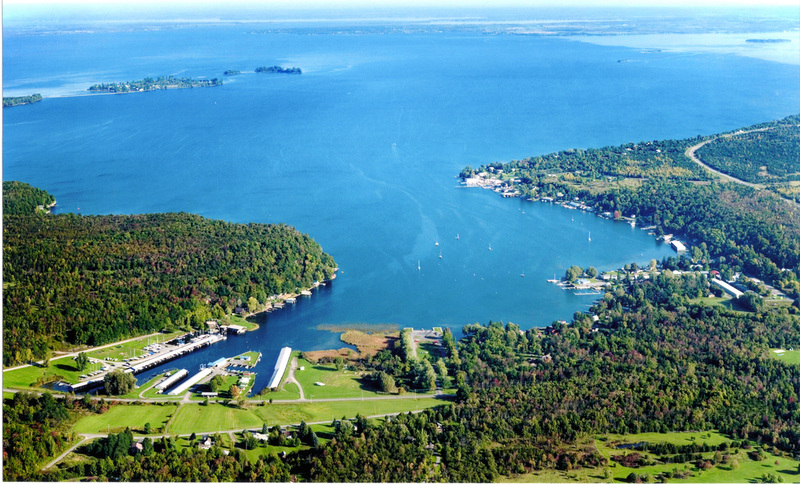 Henderson Harbor is an often overlooked gem of a small resort community as vacationers travel between New York's Finger Lakes, Adirondacks, and the Thousand Islands. Still, home to many vintage Lyman wooden boats, Henderson Harbor was the summer home for American statesmen and women of the Foster, Lansing, and Dulles family, who once controlled foreign policy, post-war German affairs, and espionage. It was also the summer refuge of a scion from a world-famous piano manufacturing family, and the manufacturer of custom caskets in which Presidents, sports celebrities, and musicians were buried. Henderson Harbor includes photographs and short stories of fishing, boating, cottage architecture, boot-legging and booze smuggling, drama and tragedy among motor-boaters and sailors, and tales of lake rescues by surfmen and coast guardsmen. It was once the summer home of a beer baron, and his son, who raised a world-class breed of dogs, and left a one-thousand-acre waterfront tract of land for a public park. Henderson Harbor is a photographic look at a small-town resort with history as deep as its cool, fertile waters.